When you put a loved one in a nursing home, you only have their best intentions in mind. More often than not, it’s when your loved one is in need of additional medical attention and assistance that you turn to this means of care, so the last thing that crosses your mind is the chance of abuse happening. Unfortunately, nursing home abuse is much more common than we’d all like to think. If your loved one has been placed in a nursing home, regardless of the quality of the nursing home or how much you’ve looked into it, you want to make sure that your loved one isn’t showing signs of abuse. Keep reading to see which signs you should be keeping an eye out for. Injuries are one of the more obvious signs that there is some abuse or neglect that’s happening in a nursing home. While bruises are something that can happen relatively easily when an older person struggles to get around on their own, there shouldn’t be any bruises that go without an explanation. If you’re seeing that your loved one is showing signs of injuries or is winding up with broken bones, you have a pretty clear sign of the damage and neglect that’s happening at the care facility. While you are hoping for additional medical attention when putting your loved one in a nursing home, the last thing that you want is for them to need hospitalization. If you hear that your loved one had to go to the hospital, be it for an injury or a higher level of medical attention, it’s not a good sign. Alarms should go off if you receive this news. It’s crucial that you learn more about what happened that led to them needing hospital care and following up with how the nursing home plans to mend the situation. Depending on the age of your loved one and the reasons that they’re in a nursing home, one of the concerns that you need to keep an eye out for is bed sores. When people stay in bed for too long without movement, their body reacts by creating sores. This is painful and uncomfortable for the senior in your life, and the worst part is that they’re almost entirely unavoidable. It doesn’t require much for your loved one to avoid suffering from bed sores. Just a little bit of movement every day, even when they’re bedridden, can drastically reduce the chances of bed sores. That being said, if you find that your loved one has bed sores, you can recognize that there is some sort of neglect happening in regards to how much care they’re receiving versus how much care they need. A drop in weight is inevitable with old age, but rapid or drastic weight loss is something that you should be cautious of. Proper nutrition and food consumption should be something that you can expect from a professional medical facility. However, this is another unfortunate scenario that we do see happening at nursing homes. While you can anticipate some weight loss with the transition into a nursing home, you should keep an eye on how much weight your loved one is losing and recognize when it has become dramatic. The last thing that you want for the senior in your life is a situation where they are suffering, neglected, or injured. While the signs that we’ve mentioned above are red flags that you should keep an eye out for, you should always check in with your loved one to see how they are doing in the nursing home and if they have any concerns. Make sure that there is an open line of communication and that you’re always taking their comments seriously. Neglect and abuse in a nursing home is something serious, and it shouldn’t go without repercussions. If this is a scenario that you’re facing, it’s time to call your lawyer. The Edwards Law Firm has a team of individuals that are dedicated to fighting your case for you. 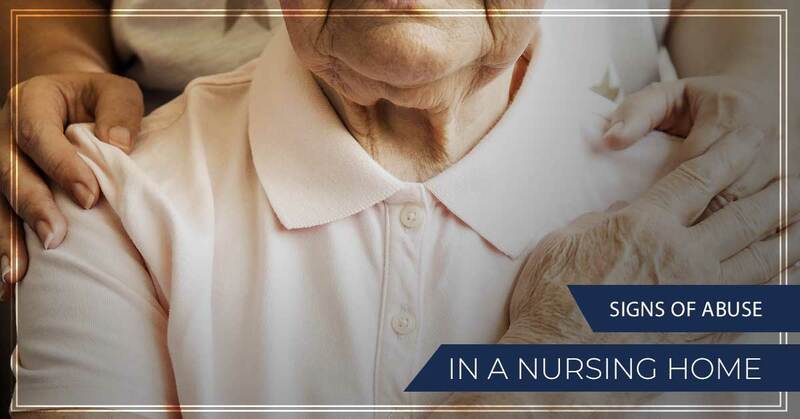 When it comes to your loved ones suffering from neglect and abuse in a nursing home, you need a team of professionals to stand behind you and provide you with the compensation and solutions that you deserve. Reach out to our team today for more information on how you can start to build up your case and find a solution. We would be more than happy to set up a time for a consultation on your situation and guide you into what’s to come of your case.